Alex Deane is a barrister, author and former Chief of Staff to David Cameron. America’s conservative movement is nourished and sustained by a TV network that’s relentlessly on its side - Fox News. That media bedrock ensures that the other side of the debate is always being put, even when the weight of liberal media opinion is united against. On British television, the stories of the day are approached entirely from a liberal perspective. The family, immigration, taxation, the NHS, education – on all of these vital issues, TV in the UK doesn’t even reflect the fact that an alternative view exists; when it comes, media criticism of the Government generally suggests that it’s not left wing enough. Internationally, news programmes on all the domestic channels always do our own country down and always apologise for those that hate us. It is rare that a Eurosceptic or pro-Israeli or pro-Iraq war position is even glimpsed. The soft left wing liberalism that permeates our national broadcaster is obvious to us. Indeed, it’s documented on a number of websites. But some of the rocket munching Islingtonistas that staff it would be genuinely surprised by the idea that there’s a problem – for they don’t realise how far leftwards their centre of gravity is (as documented by former Beeb man Jeff Randall). The pundits supposedly put up to “debate” the issues on our behalf reflect this “centre.” They’re not on the right; they’re on the right of the consensus. The “sensible” Tories are those that are asked on again and again – the Portillos of this world. The fact that such people are hardly Conservatives (or conservatives) is ignored. The fact that many such people ingratiate themselves with the media world from which they make a living by kicking and ridiculing the right themselves is appreciated. The conservative perspective on the family or on proper teaching or on immigration is one that many people feel. But when every voice on the box in the corner of your living room disagrees, you think you’re on your own. And when the message from the all-powerful media is all in one direction, the parties lamely, tamely follow the “centre” line. But the centre is what we make it. 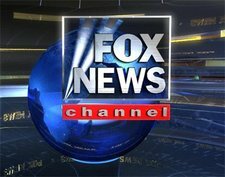 A FOX News UK would be a voice for the all-but-silent majority. It would be unashamedly conservative, patriotic, supporting the national interest. The channel would show the public the other side of the argument. It would demonstrate to the political elite that there’s a market for properly conservative beliefs. And it would pressurise the party to move towards us, constantly reminding the PCP of the grassroots, popular conservatism that got them elected. It would act as a melting pot for new ideas, encouraging creative thinking in a rightwards direction. It would shift the centre of political gravity significantly in our direction. FOX and its companions have done all of this in the USA (and turned a tidy profit, too: so if a donor’s reading this, have a think). There will be some that complain that to do this is to politicise British television. Given that it’s completely politicised already, and it’s currently 100% left, this argument can’t count for much. Millions of pounds have been poured into the Conservative Party since the election. This is wonderful: the party must be properly funded, and God willing it will win the next election. But the party will continue to find it difficult to voice a truly Conservative perspective until there is a heavyweight media voice supporting it. We must build one. So come on Wheeler et al – back it. It’s good for the public and it’s good for you – and unlike most political investments, there’ll even be a return (though not a backhander peerage). EU SERF'S FINDING THE COMMON GROUND.